Abstract : Recent advances on human motion analysis have made the extraction of human skeleton structure feasible, even from single depth images. This structure has been proven quite informative for discriminating actions in a recognition scenario. In this context, we propose a local skeleton descriptor that encodes the relative position of joint quadruples. Such a coding implies a similarity normalisation transform that leads to a compact (6D) view-invariant skeletal feature, referred to as skeletal quad. Further, the use of a Fisher kernel representation is suggested to describe the skeletal quads contained in a (sub)action. A Gaussian mixture model is learnt from training data, so that the generation of any set of quads is encoded by its Fisher vector. Finally, a multi-level representation of Fisher vectors leads to an action description that roughly carries the order of sub-action within each action sequence. Efficient classification is here achieved by linear SVMs. The proposed action representation is tested on widely used datasets, MSRAction3D and HDM05. 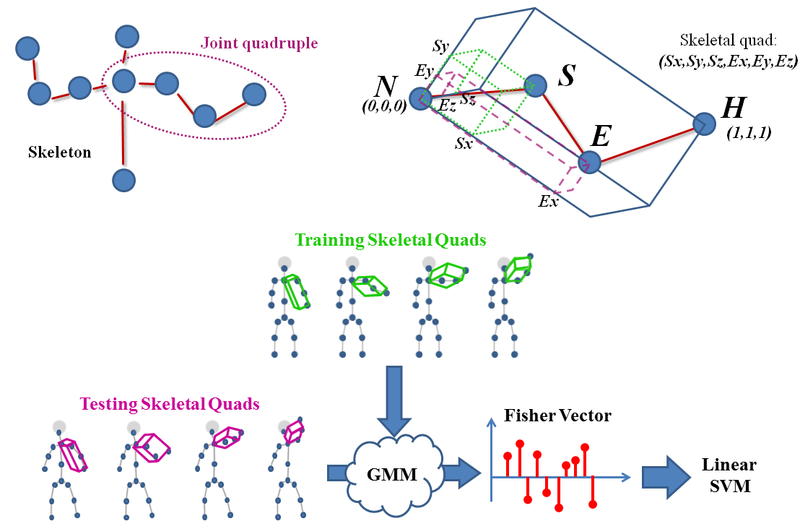 The experimental evaluation shows that the proposed method outperforms state-of-the-art algorithms that rely only on joints, while it competes with methods that combine joints with extra cues.